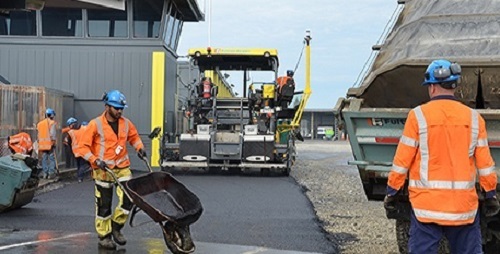 Fulton Hogan: Fulton Hogan, in partnership with Christchurch International Airport, has conducted a large-scale trial of an asphalt mix made with recycled waste plastic incorporated into the bitumen binder of the asphalt. Half of Christchurch Airport’s fire station has been paved with PlastiPhalt®, a proprietary asphaltic product developed and manufactured by Fulton Hogan. Approximately 250 tonnes of PlastiPhalt® was laid, using 3100 four-litre plastic oil containers which would formerly have gone to landfill. Fulton Hogan’s National Environmental and Sustainability Manager, Sophie Kennedy says the trial is part of the company’s ongoing drive to use sustainable practices in the manufacture of roading and industrial pavement surfacings. “This trial dovetails in nicely with Christchurch Airport’s goal of being a sustainable and carbon neutral business and is a huge step towards our own goal of reducing plastic waste streams, internally and externally, by incorporating previously un-recyclable plastic into a quality, high performing surfacing solution,” says Ms Kennedy. PlastiPhalt® is made with used oil containers collected through Fulton Hogan’s Recovering Oil Saves the Environment (ROSE) Scheme. “Fulton Hogan collects around 2.5 million litres of used oil each year from businesses such as workshops and garages and reuses this as an alternative fuel source. These containers could not previously be recycled due to the residual oil left on the inner surface,” says Ms Kennedy. Fulton Hogan began trialling PlastiPhalt® on a lab scale in 2014. It is made by shredding used plastic containers and then granulating the shreds to an ideal size for incorporating into bitumen. The plastic is then blended into appropriately classed asphalt grade bitumen. The mix laid one week ago has been specifically designed for heavy to extreme vehicle traffic loading, which makes it particularly relevant for airports and ports. Christchurch Airport have come on board to help Fulton Hogan trial this innovative product in a safe location.